Coined by Joseph Lesher in 1900 and 1901 at Victor, Colorado. Used in trade to some extent, and stocked by various merchants who redeemed them in goods. Coins were numbered and a blank space left at bottom of 1901 issues, in which were stamped names of businessmen who bought them. All are quite Rare, many varieties extremely Rare. This text was accompanied by a black-and-white photograph of the obverse of a 1900 piece and the reverse of a 1901, and retail valuations in two grades (Very Fine and Uncirculated) for 14 types and varieties. Oh, to be able to go back 60 years and scoop up these numismatic delicacies at those low, low 1957 prices! 1900 Lesher Referendum dollar. HK-788, Zerbe-2. Rarity-5. A.B. Bumstead Type, First Reverse. Silver. No. 181–Triple Struck–MS-61. Hover to zoom. The most affordable Lesher Referendum Dollar in 1957, the 1900 A.B. Bumstead, was listed at $65 in Very Fine and $100 in Uncirculated. The most expensive, the 1901 Goodspeeds & Co., was $300 in Very Fine and $450 in Uncirculated. Collectors who look at everything in bottom-line terms might wonder how much $450 invested in the stock market in 1957 would be worth today. But not everything needs to be boiled down to money. 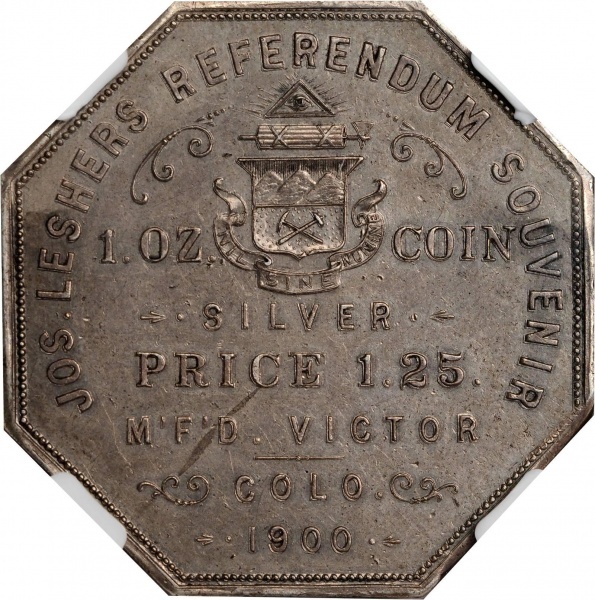 Part of the value of owning a Lesher Referendum Dollar is the opportunity to hold in your hand a rare piece of American history and marvel at its strange birth and 100-plus–years’ journey. Still, for those who are counting: Prices for Lesher Referendum Dollars quickly increased over the years following their first inclusion in the Red Book. Today the Bumstead variety is listed at $1,600 in Very Fine and $4,000 in Uncirculated. The Goodspeeds version? $27,000 in Very Fine and $47,000 in About Uncirculated, with fully Uncirculated examples now considered too rare to be definitively priced. Still, for sixty years the average coin collector’s exposure to Lesher Referendum Dollars was their one-paragraph definition in the back of the Red Book, a couple photographs (upgraded to full color in later editions), and a chart of their values in different varieties. The landscape changed, and quite substantially, in 2017. 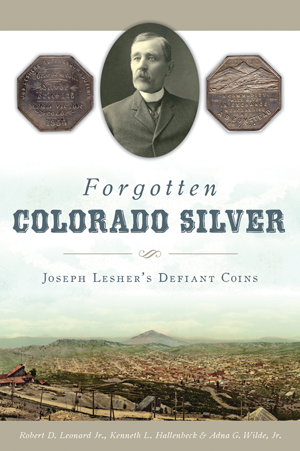 That’s the year numismatic researcher and author Robert D. Leonard Jr., along with Colorado Springs coin dealer and hobby leader Kenneth L. Hallenbeck, released Forgotten Colorado Silver: Joseph Lesher’s Defiant Coins. The late Adna Wilde, who passed away in 2008, was credited as a third author of the 128-page book, for his foundational work in the field. Joseph Lesher was a character, as one might expect of someone audacious enough to try to mint his own private silver coins in 1900. That was more than 35 years after the federal government explicitly outlawed private production of “any coins of gold or silver or other metals” for use as money. He was a volunteer Civil War veteran who later tried to milk his military service for as much government pension as he could finagle (claiming “senile disability” and physical ills despite his active engagements in real estate, prospecting, mining, and other endeavors). What inspired this effort? In chapter 4 the authors describe the situation faced by Colorado after 1893, when Congress repealed the Sherman Silver Purchase Act of 1890. This act had been a very generous congressional gift—a subsidy to Western mining interests. It required the Treasury to buy 4.5 million ounces of silver every month to be coined into dollars. This accounted for almost 100 percent of the nation’s silver production. After the Sherman money dried up, the precious metal’s artificially high price plummeted, leaving the Silver State’s miners scrambling. Various private interests, and even state politicians (right up to the governor! 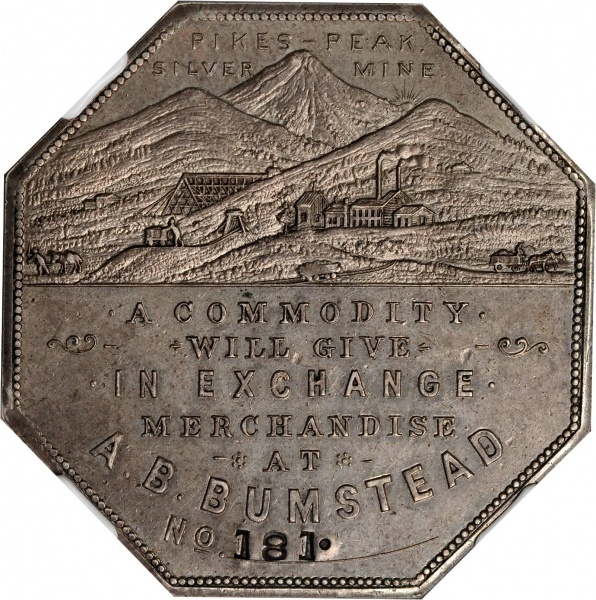 ), floated various hairball schemes to start a silver-based Colorado coinage that would keep demand high and the local mines running. Of course, the federal government’s 1864 prohibition of such coinage was a roadblock. Leonard and Hallenbeck tell how Joseph Lesher started his coining operation, and how local businesses, newspapers, the U.S. District Attorney’s office, the Treasury Department, the Patent Office, coin collectors, and eventually the Secret Service reacted to the exploit. 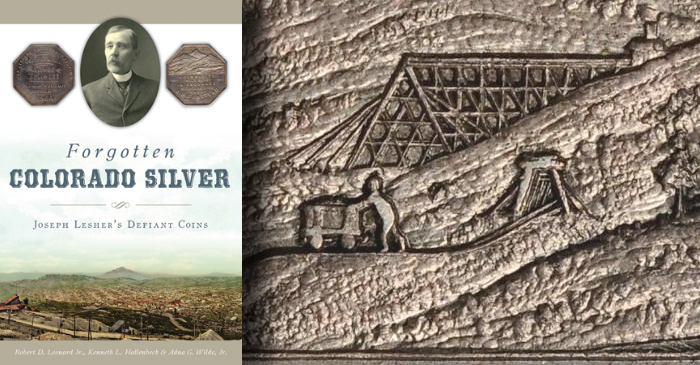 For readers hungry for more than those few sentences in the Red Book, this historical information alone is worth the price of Forgotten Colorado Silver! The authors provide much more, after having laid the foundation with the Referendum Dollars’ history. Their study of dies, mintages, and surviving populations builds on the research of Farran Zerbe. Robert Leonard went not only to Zerbe’s 1918 American Journal of Numismatics catalog but also to an unpublished, corrected version of Zerbe’s manuscript from 1934. He lays out discoveries of the 1930s and later research, and tells what happened to each of the dies used to produce the tokens (including some seized by the Secret Service, and some presumed to have been discarded by Lesher’s widow). He gives evidence of the total mintage calculated by Adna Wilde, who, after exhaustive study, accounted for 1,869 pieces struck in total. And he updates the known quantity of survivors—thought by Wilde to be 384 pieces, but now numbering about 600. The authors dig into the stories of A.B. Bumstead, a popular grocer in Victor, Colorado . . . the jeweler Sam Cohen . . . shoemaker George McMullen . . . saloonkeeper D.W. Klein . . . and about a dozen other Lesher supporters. It’s clear that a huge amount of labor went into this research. Much of it was based on the work of amateur historian Robert S. Kincaid, who started exploring the Lesher dollars in 1984 and eventually hired a genealogist, photographers, and other researchers to aid in the project. Robert Leonard carried this work to its completion, examining related Secret Service papers in the archives of the American Numismatic Society, and verifying and expanding Kincaid’s genealogical research. This research explains why certain types and varieties of Lesher Referendum Dollars are rarer than others. It also gives numismatists the meat and potatoes we love: stories of real people, flesh and blood, that connect the coins of the past to our lives today. For the generations of coin collectors who have tasted the Red Book’s “appetizer” coverage of Lesher Referendum Dollars and hungered for more: now you have it. Forgotten Colorado Silver is a delightful numismatic feast, served up with authority and panache, highly recommended. Robert D. Leonard Jr., Kenneth L. Hallenbeck, and Adna G. Wilde Jr.